Ever since I first came to know about the four sacred caves of Sikkim, I wanted to make a pilgrimage to each of them and as of now I still have not accomplished that entirely. If a chance comes my way, I will make another journey and endeavour to fulfil that wish. According to historical records, the guru Padmasambhava was requested by one of Tibet's kings in the 8th century to search for places where practitioners could practise in safety during the coming times of trouble. 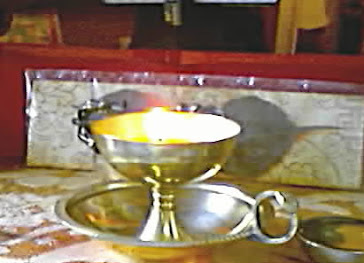 The four caves of Sikkim are deemed to be among the places which he blessed during his search. 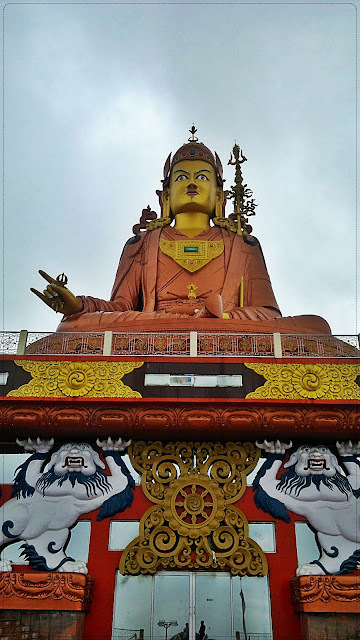 The spiritual heart of Sikkim is said to be a place called Tashiding and these four caves are located in the four directions which radiate out from this place. Two of the four sacred caves are easy to find and two are more challenging being several days walk up into the mountains along slippery and leach infested trails. One, in particular, can be reached only along a very treacherous trail which leads high into the mountains. 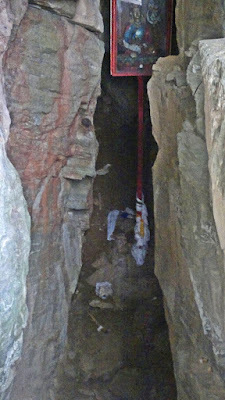 This is the cave in the West, the Dechen Phuk or Cave of Great Joy. Two caves, Cave of the Dakinis in the South of Sikkim and the Rebungla Cave are easy to get to. Chang Lhari Nyingpo in the north of Sikkim, which roughly translates as the Old Cave of Gods Hill is perhaps the oldest of the four caves. My German friend Frank and I were both keen to make this journey. Frank had spent a bit of time in the hills of Darjeeling and Kalimpong and when I had mentioned these caves to him was as eager as I to visit them. So in the year of 2008, we made a plan. Our intention was to try and visit all four caves, however, Frank was by that time living and working in Germany and could only spare a few days for our proposed adventure. Therefore we decided on one cave in the South which would be on our route into the hills north, where we proposed to climb up to the Chiang Lhari Nyingpo Cave and then we could visit if possible the other eastern cave on our way back down. There would be no hotels or eating places on our way once we headed for the northern cave, so we packed a small stash of supplies to last us for a few days. It was spring in the foothills, but still somewhat cool and also rather damp with rain falling on most days. the area to the north was flanked by dense forests and as we were yet to find out a very steep and slippery climb. On our agreed meet up day, I rose very early in order to prepare for a big day of travelling ahead. It was a cloudy morning and I could not see the mountain of Kangchendzonga from my window, which would have been the case were it clear. I had to flag down a jeep from the road above the place where I was staying. Ten minutes of concerted climbing with my luggage brought me puffing and sputtering to the gate of the forestry department. From here many jeeps would ply up and down the steep and narrow road on their way to Gangtok and Kalimpong. Frank had already been a couple of days with a friend in Kalimpong so I was going to meet him at the turn off at the bottom of the hill which was several thousand feet below where I was living at the time. From there he would pick me up in a jeep which we had hired to take us up to the beginning of the track that would lead to Chiang Lhari Nyingpo. That morning it was not difficult to flag down a jeep, find an empty seat and make my way down to the Teesta river. I got there a little before Frank arrived with our driver and it was not long before the two of us were heading east on our way into the Sikkimese foothills. As the eastern cave was on our route we made a stop at Rebungla and found the trail that led to the Pe Phuk or the Secret Cave. Honestly, we were both quite taken aback even before we even entered the cave. There was a very special sort of atmosphere surrounding the entire place and neither of us had really expected that. I guess we didn't really know what to expect. As it was already mid-afternoon, we could not linger too long in that place, however, we did take the time to sit near the entrance before climbing down into the cave itself. It was surprising how big it was inside. A large picture of Guru Rinpoche was placed high in the entrance to the cave as though guarding and protecting against unauthorised entrance. Climbing down into gloomy interior we both wished that we had a guide. There were a few obvious routes that we could have taken in order to explore the vast cavern but they looked so small and we both felt claustrophobic just seeing them. It would also have required our crawling on all fours in the dust and then wriggling through narrow openings. Neither of us being of small Nepali or Sikkimise build we decided we might leave those excursions for another visit and we plopped ourselves down in the main entrance way instead and just imbibed the atmosphere of the place. It was an impressive beginning and we were both somewhat wonder-struck. We decided that if we could get another chance in the future we would certainly return and spend more time exploring this cave. In a future visit, we would try to bring a guide. 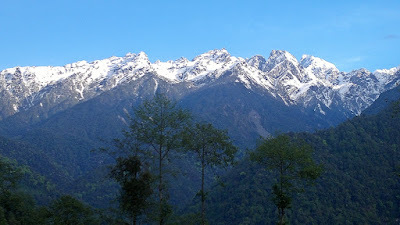 After leaving Rebungla and continuing on our way we climbed higher and higher into the foothills of Sikkim towards Tashiding from where we expected to begin our journey on foot to the northern cave. It was late evening when we finally arrived at the end of the bumpy mountainous road and at the beginning of our trail. We quickly found a lodge to stay for the night. It was cold and once the last rays of light faded would be extremely dark in these remote parts. The lodge was a basic affair but we only required shelter and water and a bed on which to sleep. Rising early the following morning we had a simple breakfast of tea and bread, loaded our packs and headed out into a bright and cloudless morning. 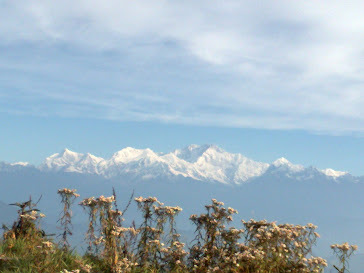 Unlike the previous day where clouds had obscured our views of the mountains, this morning a glorious sight awaited us. 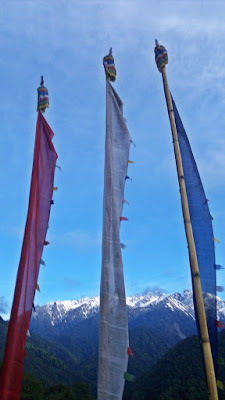 A line of towering snowy peaks greeted our vision and filled our hearts with happiness and anticipation.